My friend, @WistfulCass, told me about this event and asked me to go with her. I wasn’t sure at first. She has a novel in progress that she is passionate about. I have no less than seven complete or partial very rough first drafts courtesy of NaNoWriMo (not counting the obligatory thinly disguised autobiography), none of which I considered worthy of the effort of taking any further. Of course, my sister, Cass and several other friends beg to differ – in spite of never having read any of ’em. So, having a free-ish weekend, some Christmas money left over, and knowing that the session was being led by a writer whose work I respect and that I’d not had the chance to listen to before, I thought why not? and went along. There were about 20 of us there, ranging from the man who had never written any fiction to the woman who has written three novels with the first about to come out in paperback from a major publisher. Tricky class to pitch to! But Adele Parks made sure she found out what we were all working on as well as what stage we were at and, if the conversations at lunchtime and thanks on Twitter are anything to go by, she succeeded in giving everybody things to think about. As you might expect, her 40 tips covered things to help with theme, plot and character; practicalities to do with getting in front of the screen or page; and getting publishers to pay attention as well as readers. However, she also asked us to consider how we think of ourselves as writers. What’s our motivation? What do we read? Have we found out what works for us? How do we define ourselves and our work? This last question was rather tricky for me since every one of my attempts has been in a different genre. She told me to pick one to think about during the various exercises – but I cheated and oscillated between the literary fiction and the romance. The workshop was a perfect fit for those working on a novel and struggling with it in some way or another – although, as I’ve already said, those at other stages also felt they got plenty out of it. Of course, Adele is well-known for writing contemporary women’s fiction, but she proved herself adept at thinking outside her own field. She helped a crime writer discover their theme, a fantasy author think about their characters’ actions and a comedy writer think about their pitch. Should you have the opportunity to attend a workshop she is running, don’t let her oeuvre put you off. What’s the biggest thing I’ve taken from it? In the October 2014 edition of Writing Magazine (the one with Philip Pullman on the cover) there’s an article by Simon Whaley called Software solutions which is about some of the alternatives to the ubiquitous Microsoft Word. He spoke to me about Write or Die (WoD), a program I initially bought for fun in 2009 but has since become an incredibly helpful addition to my writing toolkit, and included some of my thoughts in the article (fame at last!). The rest of what I said about it is below but first, for those of you have never come across Dr Wicked’s creation, a brief overview. What is Write or Die? 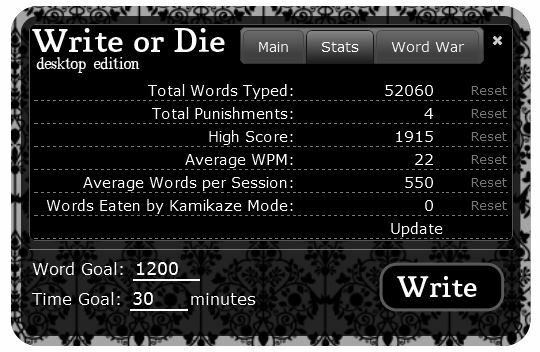 Write or Die allows you to set a word count goal to reach in a certain amount of time and then provides you with a no-frills environment in which to reach it. No formatting options, no distracting ribbons, no menus, just a window in which to type and a couple of progress bars so you can see how well you’re doing. When you’re done you can save it as a plain text file or/and copy and paste the text into your usual word processing program. So far, so straightforward, but what about the silliness? If you stop typing, WoD notices and ‘punishes’ you—it changes colour, makes a horrible noise or even, if you choose ‘kamikaze mode’, starts to delete what you’ve already written! You can select the level of punishment and the grace period before it kicks in, and there is a pause button to use when the person from Porlock calls, so it isn’t quite as counter-productive as it might seem. There’s also a statistics page for the geeky amongst us. Version 2 has a prettier interface and offers customisable rewards as well as punishments—comforting backgrounds (visual and aural) that vanish when you slow down, cute puppies every few hundred words … not really my thing so, so far, I’ve stuck with the last iteration of the old version (pictured, and possibly still available here). How does Write or Die help you? What is it that appeals? Two of my biggest problems are a wandering mind and editor’s eyes. I quite often catch myself staring at the wall thinking of something totally unrelated to what I’m trying to write about and can take ten minutes perfecting a tweet. With Write or Die, if my mind wanders and my fingers stop moving, I get called back to attention. 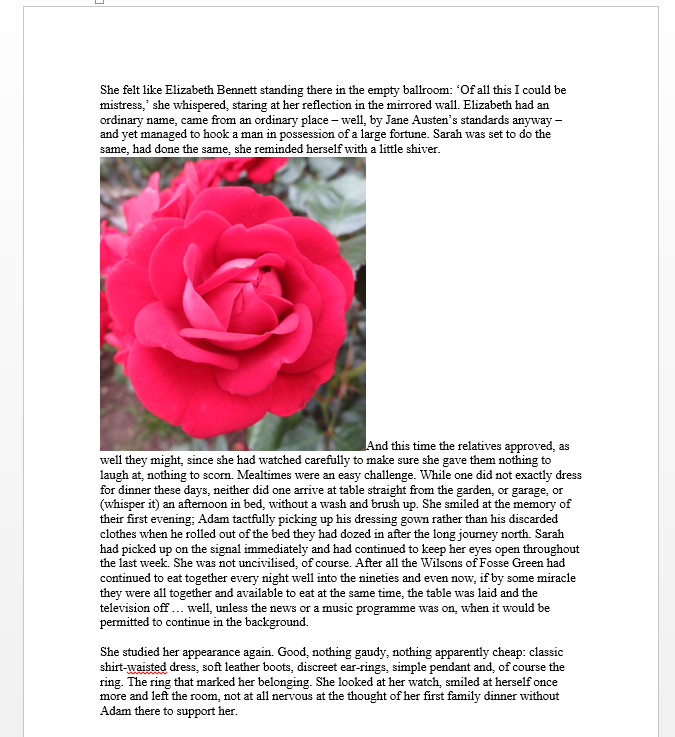 It also lets me disable the backspace, so editing as I go along becomes next to impossible – although it does mean the first thing I do with the completed text when I’ve pasted it into Word or Scrivener is run a spellcheck! I tend to set a word target that I know I can just about achieve in the time and aim to keep the ‘words’ bar just ahead of the ‘time’ bar. (Is my mathematical brain showing?) That, plus the promise of chocolate or wine at the end, is better encouragement than any kitten pictures or whatever it is the new version offers. When do you use Write or Die? I initially bought WoD for NaNoWriMo and that’s probably still when I use it most frequently—Scrivener can provide the same target-setting functionality and a distraction-free writing screen, but if I want to get words out fast WoD is still better. However, it is most useful when I realise I’m stuck or am putting off starting something, because the only pressure is to keep typing. I know that some—maybe most—of what I write will be rubbish but it’s OK; by choosing to use WoD I’ve given myself permission to not be a perfectionist, to ignore the little voice which says, “This is awful! Stop and fix it!” or, “If this is all you can come out with, you’ll never be any good!” In theory, I could give myself that permission at any time, but I’m not good at cutting myself slack—the visual cue of a different interface makes sure I get my ideas onto a page where they can be worked on. Besides, as all the adherents of free writing say, it does sometimes help take a piece in unexpected new directions. Is there a piece Write or Die helped you to produce that you’re particularly proud of? That’s a harder question, because so much of my writing never makes it beyond the first or second draft. (Who was it said you need to write a million words of garbage before you’ve any hope of being good? I’m getting towards the first target, not sure about the second.) There was a particular piece I got stuck with a couple of years ago: I knew the situation about which I wanted to write, and the character, but there wasn’t really a plot as such. So I used WoD to make myself write 1000 words in half an hour. When I looked through the disjointed paragraphs I’d produced, I found a theme I was able to develop to provide the structure for a reflective short story that has impressed everyone who has read it (sorry, everyone bar one person who never ‘gets’ what I write anyway). It’s not exactly upbeat and certainly not People’s Friend suitable, but I must get round to entering it for some competition or other one day. So, that’s one of the things I do when I have writer’s block. What about you? It is no secret that I am one of those people who mix ‘real’ books with reading on a Kindle. I am therefore in thrall to Amazon in many ways, but I have my little rebellions. I’ve never yet posted a review there, for example — their policy of deleting reviews where the author is mentioned by their first name annoys me, so I probably never will. And then there’s the attempt to get you to spend more by giving you recommendations. Since these are based on what you’ve looked at or bought they can sometimes be hilariously off-target – I don’t want a copy of Room on the Broom because I have now bought the christening present I needed and, having got 1Q84 in a 3 volume box-set, I don’t need a hardback copy of 1Q84 Books 1 & 2. Even when they get it right, the books they are pushing seem to end up being the same ones that have been reviewed in the papers, are face out on the shelves or piled high on the tables in Waterstones: the latest ‘must-reads’, the big-name authors, the safe choices. While many of these are as great as the publishers claim, what of those I might like as much or even more that don’t have the marketing budget behind them? Or are old and now out of print or neglected? How do I find those? People help, of course. Bookcrossing friends in particular are great at passing on books they think I will like … and sometimes even get it right. But they refract their ideas through the prism of their own reading and have their own impression of what I like, which may not be the whole story. Hence the misses. Sites such as goodreads and LibraryThing don’t suffer from limited knowledge of what is out there in the same way as a single person, but they do depend on me telling them what I read, which takes time. I now have a few hundred books rated on goodreads, from pretty much across the full spectrum of my reading, and can be fairly sure I will like anything it suggests. But what if I’ve read something new and brilliant and want something else just like it, an idea not influenced by all the other things I’ve read and enjoyed before? One place to try is the Gnod Literature Map. It’s a sort of virtual Hay Festival: you type in the name of an author and it appears in the middle of the screen with a whole lot of other names jostling around it. 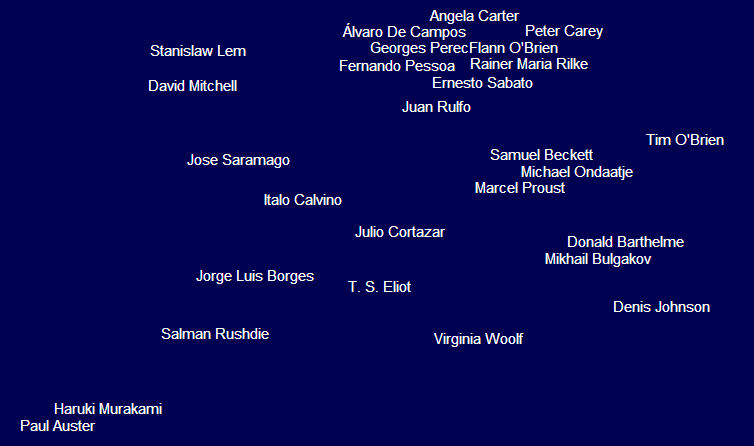 They push and shove each other into place and finally settle down – not always legibly – in a pattern which is meant to show how similar the authors are to each other. It’s fun, but it tends to be biased towards big names where there are easy points of comparison, and it only suggests authors, not books. What Should I Read Next? offers suggestions based on individual books, and it does stray out of the usual. For example, when I put in The Old Man and the Sea, as well as the obvious Melville and London and Steinbeck that I could have come up with for myself, it gave me a Flashman novel, Alvin Toffler’s Future Shock and Billy Collins’ Nine Horses – so popular fiction, non-fiction and poetry as well as more of the same. It then takes you back to Amazon, so you can find out what you’re getting from what seems to be the root of all online book knowledge. But what if you want to try something completely different? A book it’s worth taking a chance on? Everyone I know enjoys discovering a great book they’d never heard of or wouldn’t have chosen to read. I’d like more surprises or new delights than one every few months. whichbook can make that happen. 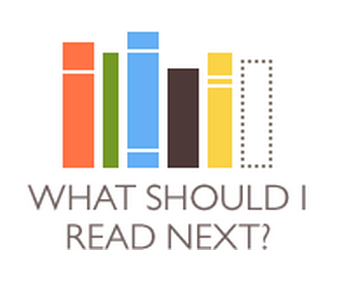 Instead of starting with something you have read, you choose what type of thing you would like to read. You can pick, for example, how happy or sad you want your next book to be, along with where it sits on three other scales from a selection of about a dozen: funny/serious, easy/demanding, long/short and so on. Alternatively you can pick aspects of character, plot and setting. You then get a set of suggestions with potted reviews of each one. I’ve no idea how extensive their search is but each time I’ve tried it’s come up with a mixture of the new and the old, and always more unfamiliar than obvious. (Recently I put in happy, funny, optimistic & short and up popped Some Things Matter by the lovely James Nash.) Best of all, there are two links below each book. Buy takes you to … go on, guess where? (Actually there are sometimes links to other online retailers and you can choose which to follow.) Borrow takes you to a map from which you can get to the online catalogue of various library services around the UK, find out if the book is available and request it. How cool is that? Which of course brings us full circle. Sometimes there’s no better way to find a new book to read than the old-fashioned, low-tech solution of walking into the library or a bookshop, choosing one with an intriguing cover or title, reading the blurb, dipping into a few pages and then taking it to the counter. No, you aren’t imagining things — that is a 3. 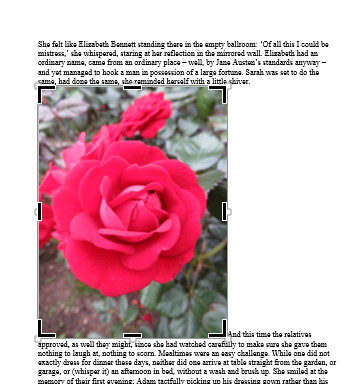 Combining words and pictures 1 (which explains how to make text wrap around pictures in a variety of ways) and Combining words and pictures 2 (which explains why pictures sometimes jump around and how to stop them doing so) appear as part of the Word tips and tricks strand of the LibroEditing blog. Putting your text straight on to the page and then using the different sorts of text wrapping available is the best way of doing things if you have a lot of text and a few pictures. But what if you have more pictures than text? 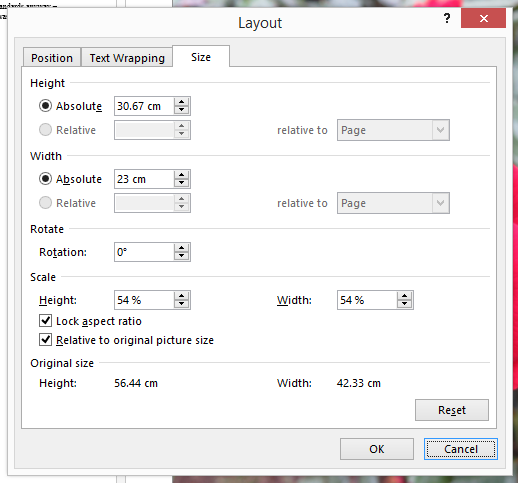 Or want to mix them up a bit more than the basic options allow – for example making sure that some text is on the left of a picture and some on the right? Clever use of section breaks and column layout can do it, but I think this way is much easier. 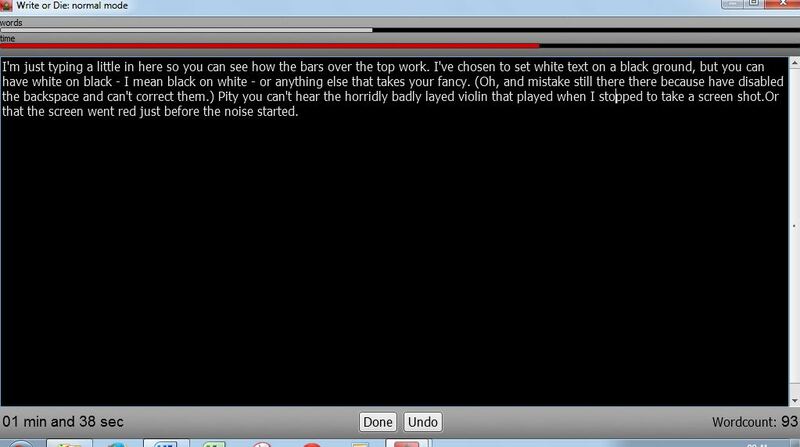 How do I use a table to arrange text and pictures? 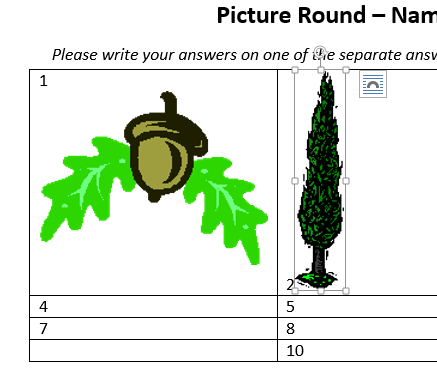 I’m going to use as an example the picture round for a quiz. We’ve too many rows to use the automatic positioning options (even if we don’t want to include a title and instructions) and our little bit of text is very spread out, so to keep it in order using tabs and returns would be a bit tricky. So I’m going to use a table. I’m going to insert a table after my first couple of lines of typing using the Insert table grid from the Tables group of the Insert ribbon. 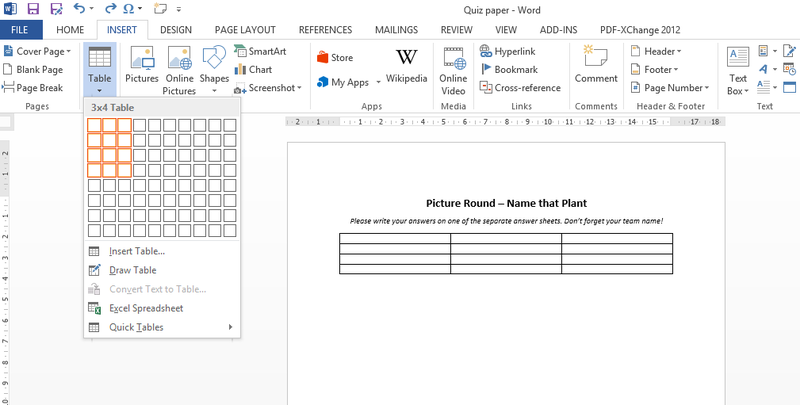 (Incidentally, it’s not usually a good idea to put a table or picture into a document before any text because it can be a bit tricky to get text to go above it later on.) I’m not going to bother getting them to the right size just yet – you’ll see why later. 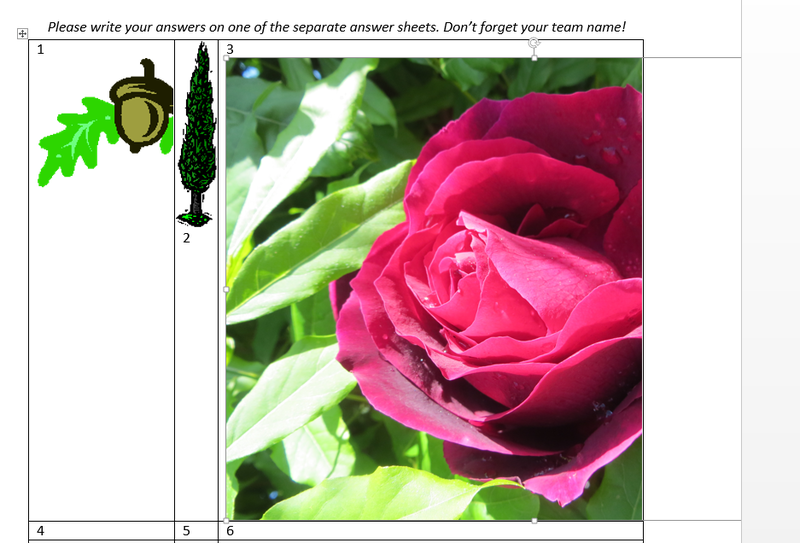 I’m going to put the question numbers in the same cells as the pictures because I want to show you how they work together, so I’m going to put those in next. If you are going to keep your text and pictures in separate boxes, then the order is less important, so I haven’t bothered with the two at the bottom yet. 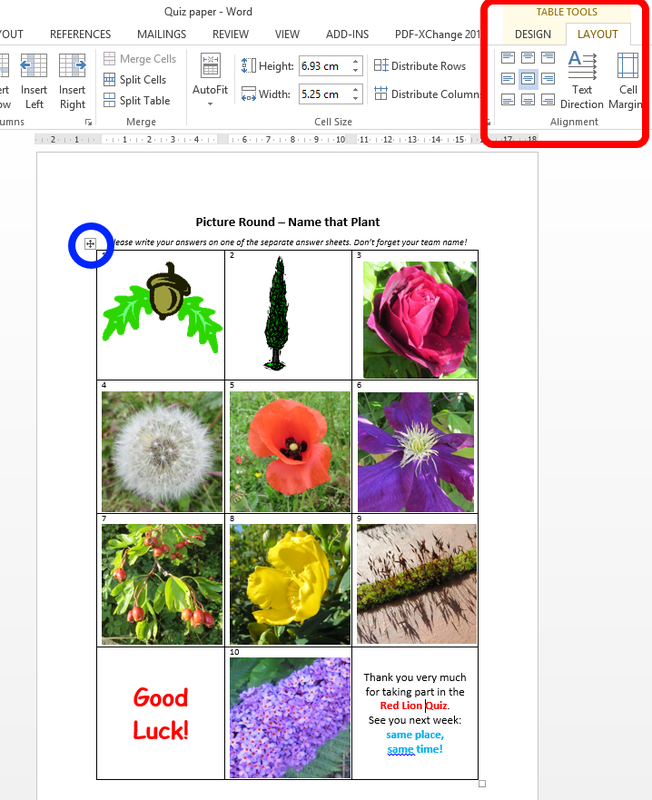 So now, with the cursor after the number in the first cell (box), I insert the picture I want using Insert|Illustration and pick the picture from the web or a file or wherever else I want. Notice that the picture is inserted in line with the text by default. But look what’s happened with the next. The number’s at the bottom. Why? Remember that when a picture is in line with text, Word treats it as a character. Our first picture was too fat to go on the same line as the ‘1’ so the oak leaf went onto a new line. 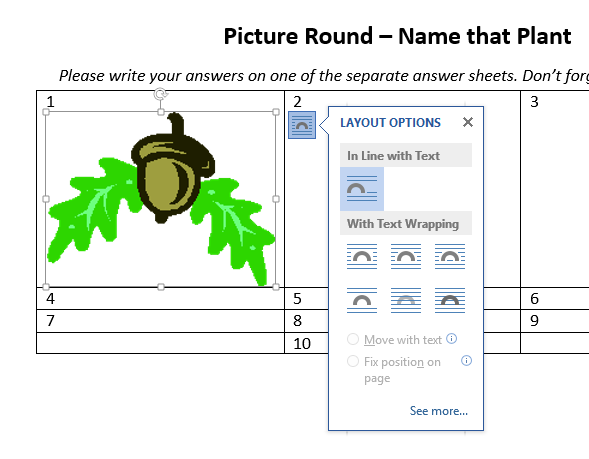 The poplar, though, is skinny enough to fit, so we need to change the text wrapping to Square (using Picture Tools|Format|Wrap Text or, in Word 2013, the option from the rainbow-on-lined-paper icon’s menu) and then move it to the right place in the cell. When I try to insert the rose, I run into a different problem. My table goes all silly and I can’t see all of pictures 1 & 3. So here it is with the remaining pictures and text added. 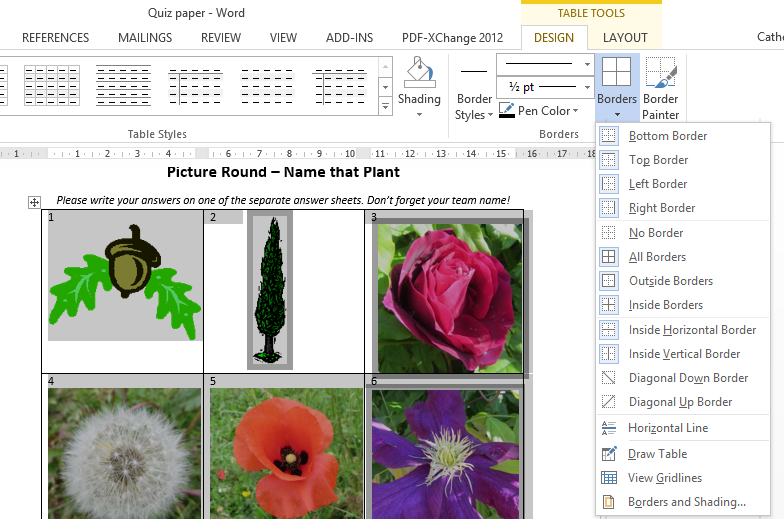 Go to the other Table Tools tab (Design) and look for the Borders group. Click the drop-down beneath Borders and choose No border. What if it’s still not quite right? You may find that your pictures aren’t quite as lined up as you would like them to be, especially if you did a lot of resizing or cropping. One way round that is to get them to the right shape and size using image processing software before you put them in – but it’s not always possible or easy to make those decisions in advance. 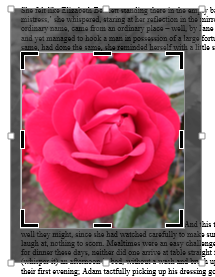 I’ll explain some ways of getting things to line up with each other in my next post on this topic, which will focus on yet another way of getting pictures and text arranged on a page in exactly the way you want.